The MRWA received notification in Spring 2005 that its project proposal for volunteer stream monitoring was approved for funding. This project will train volunteers and provide the necessary equipment to conduct water monitoring in the Muskegon River Watershed. The four targeted areas include the Tamarack Creek Sub-watershed, the Ryan/Mitchell Creek Sub-watershed, the Clam River Sub-watershed and the West Branch Muskegon River Sub-watershed (see map). Any person interested in monitoring other areas of the Muskegon River Watershed is welcome to join in and participate in the training and monitoring. MiCorps was created through an executive order by Governor Granholm to assist the DEQ in collecting and sharing water quality data for use in water resources management and protection programs. Four volunteer training sessions were conducted by Ferris State University instructor, Cynthia Fitzwilliams-Heck and Terry Stilson, MRWA Program Coordinator. Twenty-six volunteers were trained through this program. 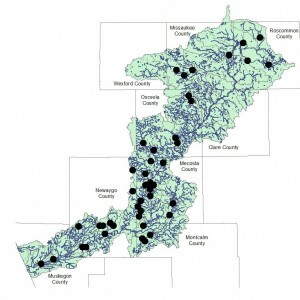 Twenty-nine sites were monitored in twelve of the Watershed’s forty sub-watersheds in the Spring 2007 monitoring. The project was completed and the grant ended on June 30, 2007. The MRWA Executive Board pledged funding to continue this water monitoring program through 2015. If you are interested in volunteering, please contact Terry Stilson at 231-591-2324 or by email.